Professor Prince’s retirement marks the end of 14 years with AMSI, including as Deputy Director under founding director, Professor Garth Gaudry and roles as Executive Director and Acting Director until 2007. He stepped into the role of Director in September 2009. Professor Prince said he was proud of his legacy at AMSI and the impact the Institute has had on strengthening Australian mathematics. “AMSI has an important role to play as the national voice and advocate for the mathematical sciences at all stages of the pipeline, it has been a privilege to lead and shape this agenda over the past nine years,” said Professor Prince. 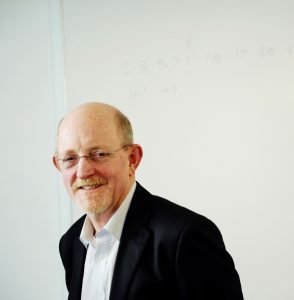 AMSI Board Chair, Dr Ron Sandland AM, praised Professor Prince for his leadership of the Institute and outstanding advocacy of the mathematical sciences. “Geoff has been an outstanding champion for the discipline, helping steer the Institute’s impact across the pipeline from school education and adult numeracy to research and industry engagement,” Dr Sandland said. Under Professor Prince’s leadership, the Institute has cemented its widely regarded status as the peak body for the mathematical sciences, providing authoritative advice and thought leadership to both public and private sectors. During his tenure AMSI has undergone significant transformation, with its staff growing more than four-fold. He has assembled a high-quality team with a clear focus on gender equity with over half the Executive team female and seven of the Institute’s eight PhDs women. AMSI’s membership has also increased its membership to 41 universities, learned societies and national agencies. Dr Sandland said the Institute would continue to benefit from Professor Prince’s long-term vision, in particular his role in securing long-term investment in higher education. “Geoff has convinced successive governments of the importance of supporting undergraduate and postgraduate education at a national level, as a result AMSI’s unique program of annual symposia, residential schools and online teaching have reached thousands of students,” said Dr Sandland. Professor Prince has successfully led engagement to secure over $50 million in grants and contracts to support delivery of AMSI programs. Notably, AMSI’s partnership with the BHP Foundation is Australia’s largest philanthropic grant in the mathematical sciences. This funding has enabled delivery of national-scale initiatives to tackle the participation of girls and women in mathematics and statistics in Australian schools. Significant Commonwealth Department of Education and Training funding has also seen an increase in scope of AMSI’s Higher Education training program and the national-scale expansion of AMSI’s industry internship program to deliver PhD internships across all sectors and disciplines.